While June 2017 marked an all-time home sales record for the Twin Cities, closed sales retreated slightly in July compared to 2016. A slow-down in sellers listing their homes was a contributing factor, as was low inventory. 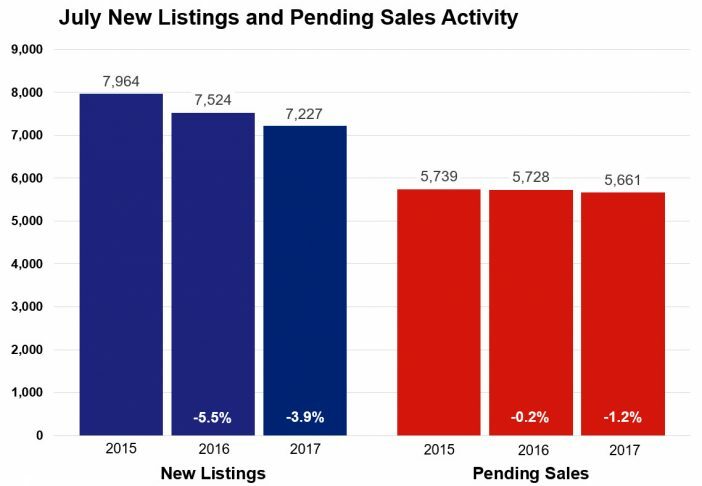 New listings decreased 3.9 percent from last year to 7,227, and the number of homes for sale decreased 18.3 percent to 12,407. That was the largest inventory decline in five months. Pending sales declined 1.2 percent to 5,661, and closed sales were down 2.6 percent to 6,020. Factoring out foreclosures and short sales, traditional pending sales increased 0.7 percent to 5,484. Weak supply and robust demand tend to encourage rising prices. The median sales price rose 5.9 percent from last year to $254,000—a new monthly record for July. Home prices have now risen for the last 65 consecutive months. At 44 days on average, homes went under contract 18.5 percent faster than last July. Despite there being fewer of them, sellers who have listed their homes recently are receiving strong offers in less time. The average percent of original list price received at sale was 99.2 percent, 0.8 percent higher than July 2016. The metro area has just 2.5 months of housing supply. Generally, five to six months of supply is considered a balanced market where neither buyers nor sellers have a clear advantage. Not only is the move-up market less competitive than the entry-level price points, but move-up sellers are getting strong offers on their homes in record time. Because of the fast pace of the market and lack of inventory, it’s extremely rare for sellers to carry two mortgages for more than a month. A thriving and diverse local economy has been conducive to housing recovery, as job growth is key to new household formations. The most recent national unemployment rate is 4.3 percent, though it’s 3.5 percent locally. The Minneapolis–St. Paul region has a resilient economy with a global reach, a talented workforce, top notch schools, exposure to the growing technology and healthcare fields, and a quality of life that’s enabled one of the highest homeownership rates in the country. The average 30-year fixed mortgage rate has declined from 4.3 percent to 3.9 percent recently, still well below its long-term average of around 8.0 percent. Excluding any surprising data or events, the Federal Reserve is likely to increase their target federal funds rate at least once more this year. Additional inventory is needed in order to offset declining affordability brought on by higher prices and interest rates.